We can top up your LAKESIDE WELLNESS VOUCHER (SEENWELLNESS VERWÖHNCARD) with any credit amount you choose, which can be used for all bathhouse services, including entrances, packages, wellness treatments or in the restaurant. 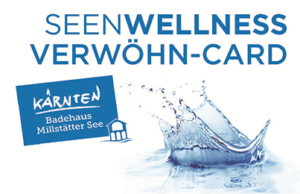 As an ideal gift for any occasion, we can also send a LAKESIDE WELLNESS VOUCHER (SEENWELLNESS VERWÖHN-CARD) by cash on delivery for a fee of € 8,20. Or you can pay conveniently by credit card over the telephone. The voucher is then sent free of charge (online print-outs are not possible).